NZ Eating Disorder Specialists views the partnership between General Practitioners and its specialists as essential for the safety and successful treatment of the individual with an eating disorder. Often when individuals or their families seek professional help they will approach GPs first for advice. NZ Eating Disorder Specialists is the specialist service that GPs can refer their patients to. The GP monitors the medical parameters of the individual, while the NZ Eating Disorder Specialists treats the psychological domain. Together they provide an invaluable support network as the individual progresses through the program and overcomes their eating disorder. Post treatment, the GP continues to be the community resource that along with the family supports the positive long term changes the individual has developed through therapy. 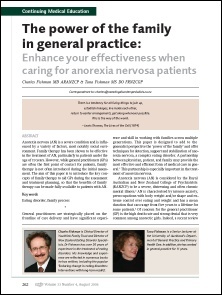 An article by Dr Fishman on this subject was published in the August 2006 New Zealand Family Physician: The power of the family in general practice: Enhance your effectiveness when caring for anorexia nervosa patients.